This blog is about the image upload and retrieval approach in SAP cloud platform through Spring based restful services, The image can be profile pics or some some thumbnail, which end users or client need to store in database along with the user information. So, instead of storing in UI application as folder structure or by any other mechanism, using this way we can store the images in the form of binary object in database along with the other information, Which we can retrieve while fetching the other information Like we have requirement that we have products thumbnail needs to upload real time along with the other product information and also customer can upload new thumbnail images, So instead of storing in the UI folder or server, we can upload the same in the database and use it whenever needs to retrieve along with the product details. It will be stored as blob object or clob object form in database. The above file can be part of one web folder basically in the resource folder and the xs-app.json file be part of the main project which will be used to route the request of server for uploading and retrieving of the images or thumbnails images. You can check the details project structure and files being used in the application in the github account. The apps can be deployed in SAP cloud foundry platform as the mentioned app is being developed and evaluated in SAP cloud foundry account. Create and build JPA Project: You can refer my previous log series regarding project setup blog series. Here we need to use this jar as the file upload is of multipart and for that we need to use this API to upload image as multipart data type. 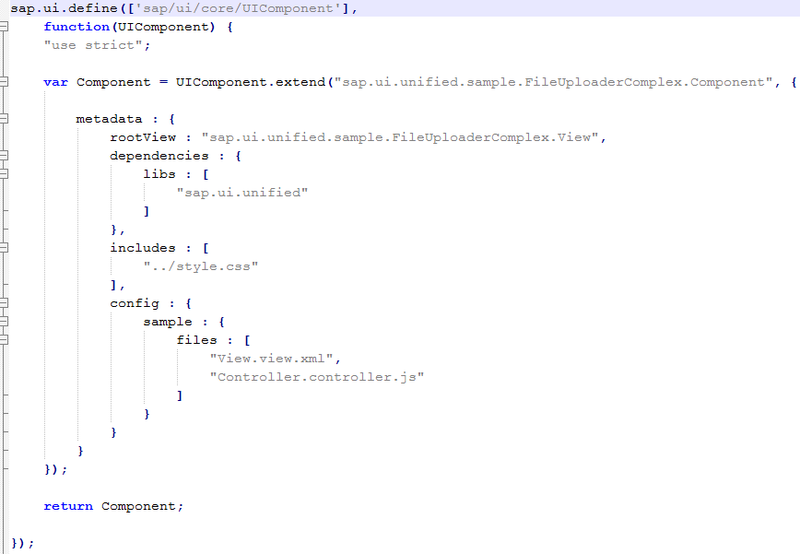 3.1 Configure persistence.xml in JPA model: Refer to my previous blog series log series for this section. 4. 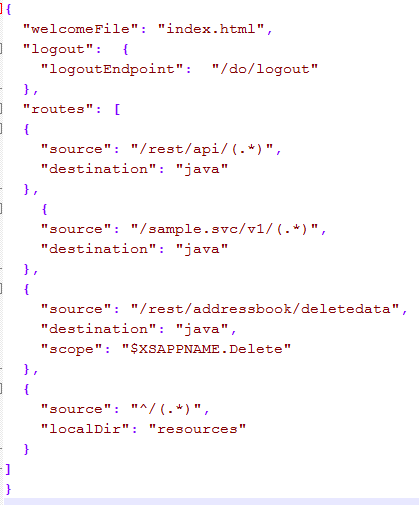 Adding the spring-servlet.xml file under WEB-INF folder: Refer to my previous blog series for this section. As shown in the above snapshot that the minimum & maximum upload sizes are defined. Beyond that, will throws an exception. 4.1. 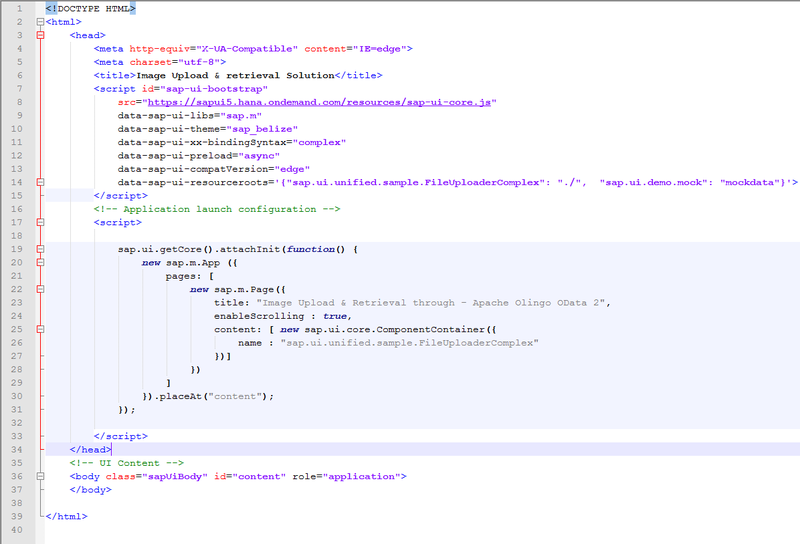 Spring-servlet has to be included in web.xml file, code snippet has to added : Refer to my previous blog series for this section. 4.2. Now create class where using JPAEntitymanager establish a connection, basically to connect to database. As shown above the image object accepted in the requestParam as multipart data. As above mentioned in snapshot that there are two method, first method is used to store the image as binary object into the database. Second method is used to fetch the image from database. In the above code base, we have class, the service and the service Implementation class. In service class the upload image or files can be read and then in the implementation class, the actual business logic is mentioned to upload and retrieve of the images. This implementation will deal with any type of binary content, It can be doc, pdf etc. The Entity class needs to be added into the persistence.xml file. 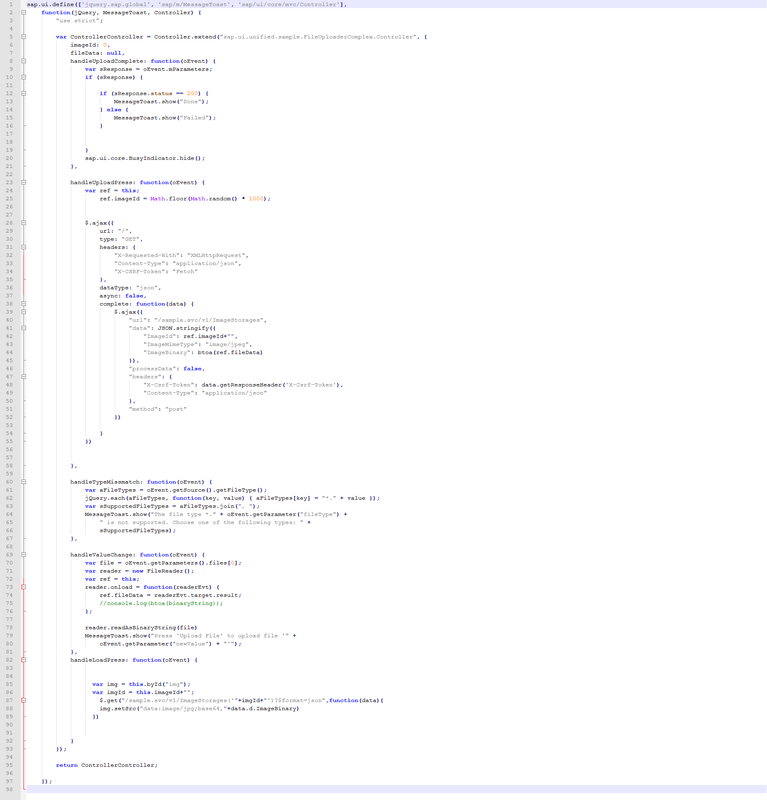 The annotation @Lob has to added for the column which mapped to byte  columns as it bind with the binary content. As shown above the IMAGE_BINARY fields stores the image object in the blob format. The above database field might change based on the requirement. In my case I have tried to show only for the image content save as blob object, it can be added for any number of fields and any type of content that can be stored as binary content. This blog is about implementation of binary content and retrieval through Spring MVC from database, Of course there is a documentation and numerous materials about image processing or storing using spring MVC in the database, Here I have explained about the end to end integration from UI to back-end, along with the database binding mechanism. It’s an attempt for persisting binary object in db. With the above approach, we can implement how to store any image content in the form of binary or blob object into database. Few of my other blog post refer below the links.